quarterly dividend increase since the beginning of 2018.
were $10.9 million or $0.38 per diluted common share. million of fundings on existing commitments. Facility”) to extend the initial maturity date to December 14, 2020.
million or $1.43 per diluted common share. for investment as measured by outstanding principal. outstanding principal were repaid or sold since inception of the Company. fixed rate loans, the applicable interest rate. spread of 3.15% (plus fees) and an initial term of three years. an initial term of two years. of Stockholders will be held on April 23, 2019. Time) to discuss its fourth quarter and full-year 2018 financial results. 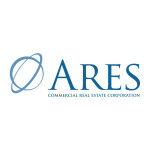 page of the Investor Resources section of the Company’s website at http://www.arescre.com. Please visit the website to test your connection before the webcast. Commercial Real Estate Corporation” once connected with the operator. (877)-344-7529 and to international callers by dialing +1(412)-317-0088.
approval by a majority of the Company’s independent directors.